For Russian President Vladimir Putin, Syria is a daily personal chore. He would prefer to work openly with US President Donald Trump for sorting out the crises in Syria and Iraq – both have now established new bases in Syria (about which see a separate article). But so long as Washington is barred from overt cooperation, Putin is moving ahead on a program of his own which he is trying to sell to Turkey and Iran. 1. A Russian team for promoting reconciliation in Syria (TSPVS) is active in different parts of Syria. The team is overseeing the spotty ceasefire that went into effect last year and setting the scene for the withdrawal from Syria of all foreign armed groups, especially the pro-Iranian Lebanese Hizballah. 2. On March 15, the original ceasefire brokers, Russia and Turkey, added a third, Iran, when their delegates met at the ongoing Syrian peace conference in Astana, the capital of Kazakhstan. 3. Iran is to be formally designated one of the three guarantors of the Syrian ceasefire. 4. The Russian TSVPS carries the main responsibility for monitoring the ceasefire and Syria’s phased reconciliation process. 5. Russian officers will act as observers at potential flashpoints to ensure that all combatant forces observe the ceasefire. 6. Those officers will also verify that the Shiite militias who fought for the Assad regime are pulled back from the different fronts. 7. The three guarantors, Russia, Turkey and Iran, will explore converting areas currently occupied by Hizballah, especially in northern Syria, into neutral “safe zones” after their exit is assured. 8. A key issue is the exit from Syria of all foreign forces, including Turkey, Hizballah and the other pro-Iranian Shiite militias imported from Afghanistan and Iraq. 9. Iran will be asked to accept a kind of tradeoff, whereby its proxies will pull out in return for a Turkish army guarantee to guard Iranian interests in northern Syria. 10. The Iranian delegates to the Astana conference have verbally agreed to this blueprint. Hizballah too may be persuaded to accept it for the sake of bringing its fighters back home from the battlefields of Syria. 11. Still up in the air is the disposition of the imported Shiite militias, an issue to be aired in the next round of the Astana talks in early May. The Russian president’s 11-point program for ending the Syrian conflict is seriously obstructed by two figures, the Iranian al Qods chief, Gen. Qassem Soleimani, who is supreme commander of Iranian forces in Iraq, Syria and the Lebanese-Israeli and Yemeni fronts, and Hizballah’s Secretary General Hassan Nasrallah. Both are holding out against Putin’s plan so long as it is not approved by Iran’s supreme leader Ayatollah Ali Khamenei. He is still undecided over whether to go along with Putin and the Russian army in their quest for a final resolution of the Syrian civil war, mainly because he has not yet assessed how this decision will play in Iran’s upcoming presidential elections in May. a) Hizballah forces this month quit their western bases on the Qalamoun Mountains and headed south towards Mt Hermon on their way to Quneitra and the Golan border with Israel. 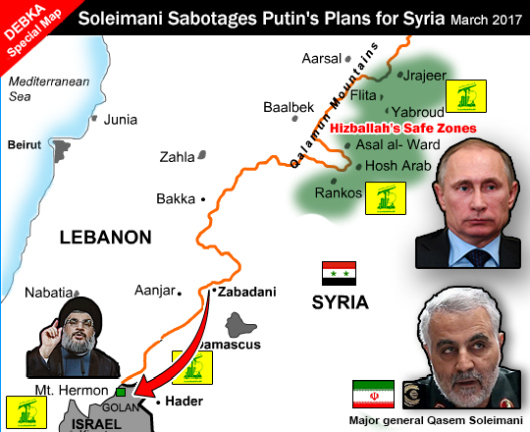 b) Soleimani and Nasrallah joined forces to resist the Russian plan to remove their forces from Syria and replace them with safe zones and a seriously diminished presence. Hizballah was sent south for two missions: to make the Golan another confrontation front with Israel – was one; the other, to take over southern Syria to gain strategic depth for their South Lebanese front against Israel. c) For this purpose, Soleimani ordered the 1.500-strong Iraqi Shiite al-Nojba militia to leave its position in Aleppo and move south as back-up for the Hizballah drive through Hermon to Quneitra. Nasrallah’s deputy, Sheik Na’eem Qassem, had taken these Iraqi Shiites under his wing and arranged for Hizballah officers to provide them with combat training. Russian officers did try to stall this redeployment to prevent it becoming the harbinger of a wholesale migration of Iraqi Shiite militias from northern Syria to the south, a process that would kill Moscow’s plans for Syria stone cold. d) The Iranian general arranged for the delivery of high-tech electronic and radar equipment for upgrading and improving the accuracy of Hizballah’s ballistic missiles. They were shipped last week from Tehran to the T4 military base near Palmyra in northeastern Syria. Thursday, March 16, the new equipment was loaded on civilian trucks which began rolling towards the Lebanese border. Early Friday, when the trucks pulled up by the side of the Palmyra-Homs highway for refueling and a break, four Israeli F-15 jets appeared in the sky and smashed the trucks and their freights. Moscow instructed the Russia commanders on the spot to desist from interfering or trying to hit the Israeli bombers. But Soleimani forced the Syrians to shoot a salvo of four SA-22 anti-air missiles. By then, the Israeli planes were out of Syrian air space and flying over the Sea of Galilee. The Syrian missile’s 200kg explosive warhead was intercepted – before hitting one of the Israeli jets or landing on an Israeli lakeside locale – by a powerful Arrow-3 anti-missile missile, making this the advanced system’s first operation in real combat against an enemy missile. DEBKA Weekly’s publication this Friday found Soleimani and Nasrallah in full momentum for dictating the pace of events in Syria. Their enterprise is so far confined to the south, while the US and Russia are moving forward in the north, as will be seen in a separate article.